All transactions are safe and secure with a reliable history in online purchasing behind each of our associates. 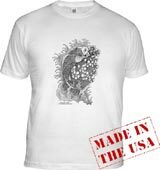 Buy the Japanese Carp Tattoo shirts to own Miami Ink clothing and merchandise. These Japanese Carp Miami Ink style tattoo shirts are one of a kind Ts, which feature a black and white pencil style drawing of a Japanese Carp splashing in the water. The design is the original artwork of Highlands, NJ artist Erik Lukacs. It resembles the nearly identical Koi fish (ornamental carp) that can be seen on the Miami Ink tee shirts. Tattoos of such fish are traditionally considered lucky. In addition to the Japanese Carp Tattoo tees above, browse the Miami Ink Clothing Gallery for more apparel like men's and women's clothes, kids shirts or hoodies.